The very first birthday of a little one is special. The child may not remember it when they’re grown, but the memories of friends and family members will make for timeless stories. Make the birthday even more extraordinary with a thoughtful message. The birthday boy or girl might just look back on it and smile when they’re older. It’s your child’s first birthday, and you want to make it a day to look back on fondly. Use one of these thoughtful, loving messages to make this birthday special. Our darling child, you have brought us so much joy from the moment your entered our world. 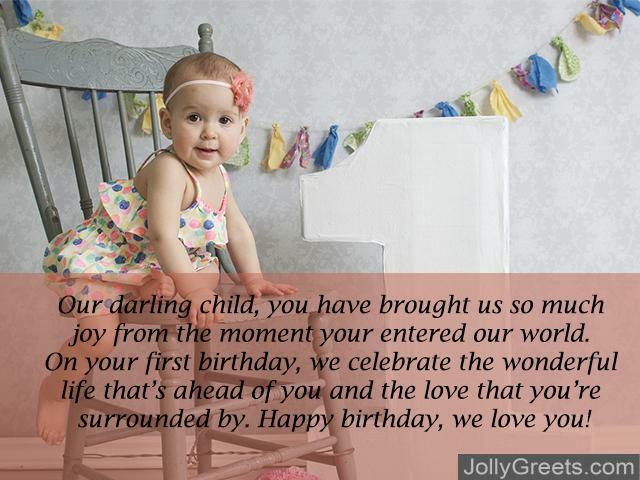 On your first birthday, we celebrate the wonderful life that’s ahead of you and the love that you’re surrounded by. Happy birthday, we love you! You, our wonderful child, are the greatest gift either of us could ever hope for. Today is your first birthday, and we hope you feel the enormous amount of love that surrounds you. Happy birthday! When you look back on this day years from now, know that you are so loved, so special, and an extraordinary blessing to us both. You’re only one year old, but we couldn’t be prouder of you. Happy birthday! Being parents has made us feel more happiness and love than ever before. Our wonderful child, we can’t believe you’re already one year old! We love you so much and can’t wait to see what’s in store for you. Happy birthday! When I look at you, I see hope and boundless potential. You’re a blessing that we’ve come together today to celebrate. We love you, my baby boy, more than you could ever imagine–happy birthday! One year ago, you arrived into my world and I learned what complete, unconditional love is. Happy birthday to my baby boy, I love you more than you know. There aren’t enough words in the dictionary to express my unconditional love for you. I have only known you for a year, and yet our bond is stronger than anything. Happy first birthday, my baby boy, I love you so much. My baby boy, today is your very first birthday. I love you more than you’ll ever know. Always know that I am here for you, no matter what twists and turns life has in store for you. Happy birthday! My beautiful baby girl, I wish you nothing but joy, adventure, love, and excitement. You’re turning one today, and I can’t wait to see you grow into an outstanding young woman before my very eyes. Happy birthday, I love you so much! One year of growth, of smiles, of tears, of love. My gorgeous baby girl, you are everything. Happy first birthday, I love you! My endlessly beautiful daughter, I can’t believe it’s already been a year since you came into my life. Today, we celebrate you and the wonderful life that’s ahead of you. You bring me joy each and every day. Happy birthday, I love you! 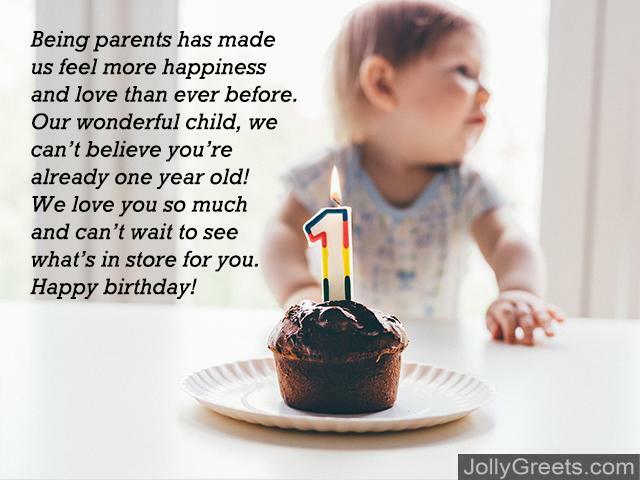 A first birthday is a precious milestone, a time to celebrate the beauty of love and life. You are a beautiful gift to this world, please never forget that. Happy first birthday to my baby girl. You shine brighter than the sun, you’re more beautiful than the stars, my love for you is deeper than the ocean. Happy first birthday to my lovely baby girl. The joy that you bring me every single day is the joy I hope you feel on every birthday for the rest of your life. Just the sight of you makes me smile. Happy first birthday, I love you so much. Every birthday is a cause for happiness and celebration. But today, on your first birthday, the joy seems to be bubbling over. Happy birthday, I love you. This is just the first of so many birthday celebrations to come. 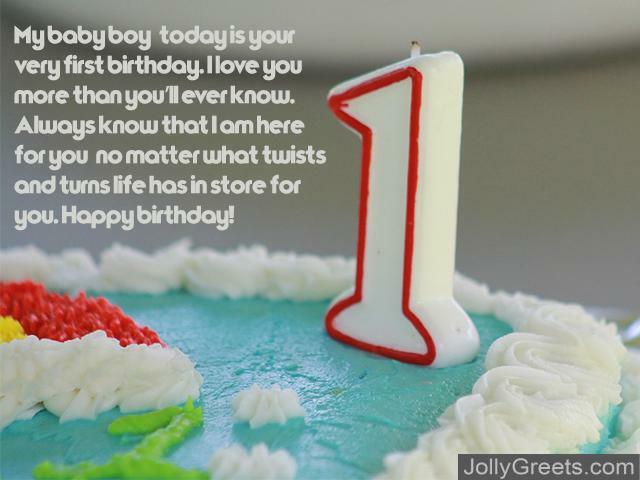 It’s your first birthday cake, the first rendition of “Happy Birthday” sung just for you, the first anniversary of your glorious birth. You are so loved. Happy birthday! When you smile, the whole room becomes so much brighter. You are just one year old, and yet I love you enough for an entire lifetime. Happy birthday, my dear! Being a grandparent has brought me more joy than I could have ever imagined. My darling grandson, I am thrilled to celebrate your first birthday, and I can’t wait to watch you grow up. I love you! Happy first birthday to my wonderful grandson. Your smile lights up my life. Let’s have fun today, I love you so much. To have a grandson is to have an endless source of happiness. You make me laugh, smile, and feel so proud. Happy first birthday, I love you so much. Today is your first birthday, my little grandson! From the moment you came into this world, I have loved you unconditionally. Watching you grow older will be one of the greatest joys of my life. Happy birthday, I love you! Make that very first birthday special. The memories you make now will become beautiful stories in future years. One of the messages above is the perfect way to create a birthday celebration for the birthday boy or girl to remember years from now. After all, a birthday is a wonderful occasion to say, “I love you”.